and we'll give you a gift! Any readers on your holiday list? 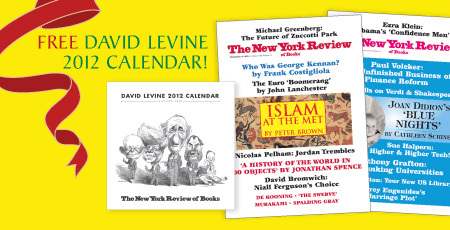 When you give them (or yourself) a subscription to The New York Review of Books you will receive a FREE David Levine Election 2012 Calendar. This year's edition collects 13 historic caricatures of US presidents by David Levine whose work has appeared in every issue of the Review since it began publishing in 1963. Bruce Weber called his work "…not only witty but serious, not only biting but deeply informed, and artful in a painterly sense as well as a literate one." Keep it or re-gift it! Plus, each additional gift subscription you give saves you $20.00. And all subscriptions include exclusive subscriber-only access to five years of the Review's online archive. The New York Review of Books has been a forum for writers and thinkers to discuss not only current books but also the provocative and complex issues of culture, science, economics, politics and the arts. Wouldn't you or someone you know like to join our small but influential audience? Click here to subscribe or give a gift today, and to get your free calendar!